The work of Philippe Decrauzat involves the view (looking) by his strong physical presence which beyond the retinal and perceptive game recreate the environment in a new relationship between culture and history. Despite the fact that his work formally belongs to abstraction and Op Art, it is more the result of various influences. The links created with the history of forms but also with the so-called low culture suggest a change in our perception of those two worlds respectively considered elitist and popular. He does not only proceed by appropriation, but prefers discrete and intermingled references; he choose his motives and forms for their spatial and visual qualities. 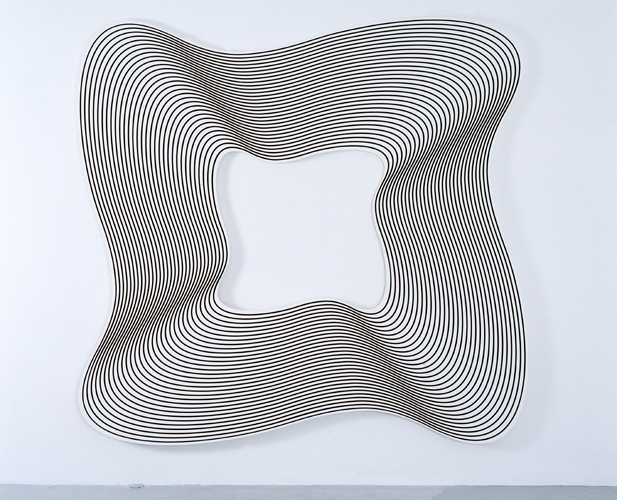 In an interview, the artist precises the link whith this kind of vocabulary: "I am interested in this direct relationship that Op Art creates with the viewer, by the manner it influences the way we look at the masterpiece. However, unlike the artists of the eighties, i'm not trying to develop a discourse about the ideological stakes which have accompanied the historical development of abstraction. Far from being tributary of Op Art, I'm more interested in the practical question about the status of the image, by which I mean the tools brought on the scene by conceptual art and the pop art." The distortion which operates in those forms is the result of this compression of various influences, this variation on motives more or less dominating. But in the same time those references to a more popular culture relativize the optical experience. This material of signification and motives tied altogether can be experienced as wandering: an emancipated way of using a rigorous vocabulary that the artist approachs skew, by playing or in declination like a type-setter who would repeat a sound motive to which he would print his own modulations in order to create a dynamic image. 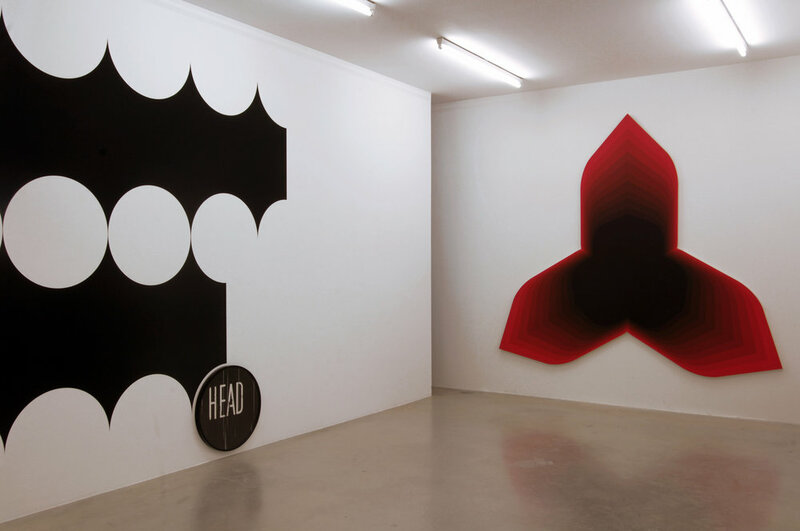 For his first solo exhibition in France at Praz-Delavallade, Philippe Decrauzat has made a large gallery in the space of the gallery along with a presentation of different canvas and sculptures from his recent work where the idea of movement is the main subject but in the same time, seems suspended. "KOMAKINO" (A Japanese dance which casts a hypnotic effect on the viewer; the title of a Joy Division song; and a word-play KOMA-KINO / coma-cinema) is a work that articulates both wall painting and drawings. The wall painting is comprised of a grid filled with round and framed drawings. Decrauzat uses as a basis for his composition the geometrical form of a perforation found in Brion Gysin's "dream machine"—a particular cut found in this machine whose original function was to create an unusual spatial rift by allowing repetition in an image create a form of spatial perception that could be seen when looking at the spinning work up close. In another room, Decrauzat presents large canvases with diffuse waves, some sort of variation of the shaped canvas from Frank Stella where the painting takes up the entire space. In confrontation with these canvases is an important sculpture titled "Process", a work inspired by a bench created by Moholy-Nagy in 1920 for a room of the Landesmuseum in Hannover. After transformation, the volume seems to expand gradually in a two-dimensional plane making it impossible to sit on.